Description: With two different number plates, a CP train blows past the Como Ave grade crossing in St. Paul. Title: Looking back at junk. Description: This CP-UP transfer passes me as the sun breaks through a cloud filled sky. Description: Two switchers idle in the Ford Plant yard. Description: Rolling into Humboldt Yard in NW Minneapolis. Description: The history of these yard switchers is evident. Description: A trio of SD40-2s sat at Robert St. for three days until I snapped quite a few pictures. Description: This unit connected with a semi at a crossing weeks earlier. 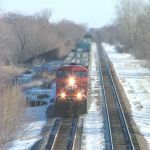 Description: An eastbound CP train moves across Union Jct. Title: Getting out of Dodge. Description: Southbound on the CP/BNSF shared trackage. Description: As usual, a single unit struggles with a CP manifest. Description: A switcher maintains order in the yard at St. Paul's Ford Ranger plant. Title: Its geneology is obvious. Description: Idling at Hastings, this ex-Milwaukee Geep hangs onto a caboose. 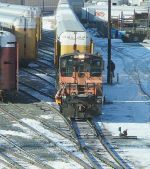 Description: A pair of SOO-livery units near Fordson Jct in St. Paul. Description: North at Maryland Ave. Title: Always with the single unit. Description: Autoracks up front, general merchandise later. Description: A sweeping look at the two EMDs doing thier daily task. Description: Two AC4400s move eastbound with grain hoppers and flat cars with pipes. Description: This AC44CW doesn't slow down as it passes Shoreham Yard. Description: A CP intermodal rolls into Humboldt.